In this first episode of the Eatweeds Podcast wild food chef Paul Wedgwood from Edinburgh talks about making Garlic Mustard Dolmades (Alliaria petiolata). Research herbalist Monica Wilde takes us through the latest scientific findings on whether comfrey is safe to eat, is it? And finally Alex Laird from Living Medicine talks about the importance of using common plants found around you and in your kitchen for self care health care and to support your own path to wellbeing. Monica Wilde: Is Comfrey Safe To Eat? Thank you for great podcast. However, I believe you are not right about comfrey species. I am not botanist but I had botany classess when I studied forestry. I did my thesis in ethnobotany and I am forager teacher in Slovakia, though I come form Poland. Here in eastern Europe I never saw comfrey with creamy flowers and leaves like on your picture. 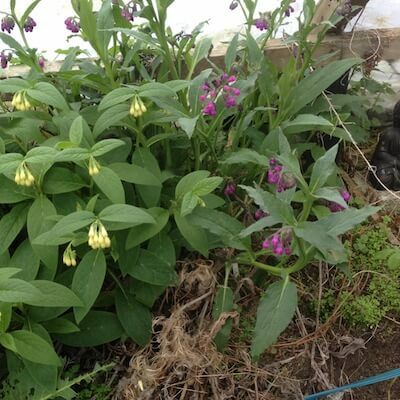 Our comfrey (S. officinale) looks pretty much like the one on the right, with purple flowers and more pointy leaves. Very seldom it has white flowers, but I never saw creamy flowers. According to local botanist, there is no Russian comfrey here. I really like comfrey leaves, fried with yeast or alone, or like indian pakora. I also dry them, make tea or ointments out of them. I love comfrey root as well – did you know that comfrey root syrup (from S. officinalis, the one with purple flowers and more pointy leaves) was sold in Poland in drug stores 30 years ago? I make it myself, as well as tincture. Ask Lukasz Luczaj for more details, his student made research – comparison of PA content in different ways of preparing the comfrey leaves. I don’t think it was publishes yet. Bartosz – Thanks for your comment. Over in the UK Common comfrey (Symphytum officinale) has creamy flowers and Russian comfrey (Symphytum x uplandicum) has purple flowers. However we have a number of other species and they can all hybridise, hence the flower colour can be different. Also region/location plays a big part, and colour, shape, form can vary as well. Thank you, such great podcasts!